Earlier this week images were appearing on the internet showing that the WhiteKnightTwo craft had been doing some tests in Mojave, the earliest tests showed perhaps two of the engines being used, while a later test showed all the engines working and some further testing. Today we finally saw the four Pratt & Whitney Canada PW308A engines carrying the craft into the air and a huge milestone being reached by Virgin Galactic. The maiden flight of the craft lasted just shy of one hour and happened today at around 08.15 at Mojave air and spaceport. Rumours suggest that a Beechcraft King Air was used for a chase plane. 12th December – A low-speed trip down a runway. This key event now leads us into an interesting 2009 when we should see the SpaceShipTwo craft being unveiled. 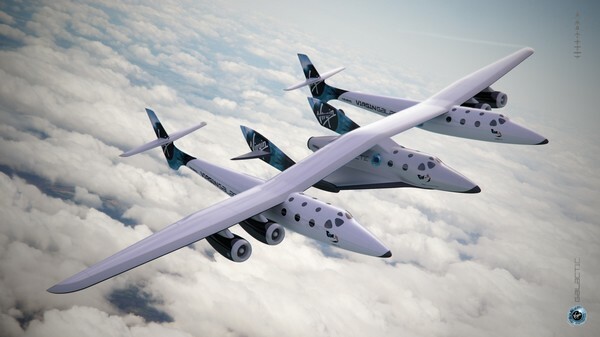 Virgin Galactic is the world’s first spaceline. Giving you the groundbreaking opportunity to become one of the first ever non-professional astronauts. Virgin Galactic will own and operate its privately built spaceships, modelled on the remarkable, history-making SpaceShipOne. Virgin’s vast experience in aviation, adventure, luxury travel and cutting-edge design combined with the unique technology developed by Burt Rutan will ensure an unforgettable experience unlike any other available to mankind. With safety at the forefront, our unique spacecraft is being designed at Rutan’s base in Mojave, California alongside a concerted research and development programme. “The deal with Mojave Aerospace Ventures is just the start of what we believe will be a new era in the history of mankind, one day making the affordable exploration of space by human beings a real possibility.” Richard Branson. It is these spaceships that will allow affordable sub-orbital space tourism for the first time in the history of the universe.